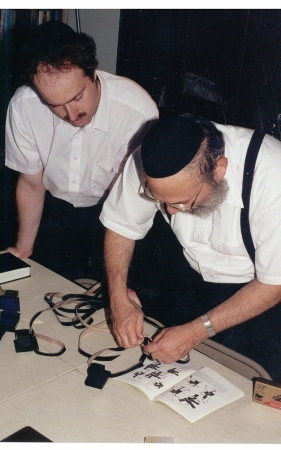 We offer Tefillin (phylacteries) to those men who wish to fulfill this vital mitzvah but have not yet purchased their own set. We can also lend Mezuzahs to those who wish to put them in their home, until they are able to purchase their own. On Sukkos, the Center’s Lulav (four species set) and Sukkah (special holiday booth) are open to everyone so that they may experience the unique mitzvahs of that holiday. We also offer a workshop in the Shofar, showing participants how to blow the ram’s horn that is such a special part of Rosh HaShanah. A Sefer Torah (Torah scroll) is the highlight of our collection; we use it to demonstrate the laws of preparing and writing the Torah scroll. By coaching you in the proper use and care of these holy items, we can help guide you and ease you into correct Torah observance.